- Synthesis and control of smart supramolecular polymers - Elaboration of stimulable surfaces - Functionnalisation of titanium based biomaterials. Missipssa BENATMANE, Polymères à UCST à base de pillararènes modifiés pour la catalyse supramoléculaire . Thesis started in 2018. Other co-advisor: Jonathan POTIER. Aurélien VEBR, Smart supramolecular hydrogels . Thesis started in 2018. Florine NONQUE, Nouvelle molécule plateforme à base d'isosorbide pour l'obtention de matériaux biosourcés hautement performants . Thesis started in 2017. Other co-advisor: Jonathan POTIER. Lieselot DE SMET, Smart hydrogels . Thesis started in 2015. Imen BEN CHRAIT, . Thesis defended in 2018. Marie DUBAA, . Thesis defended in 2018. Other co-advisor: Fournier David. Nérimel Laggoune, (Multi)stimulable macromolecular assemblies based from pillar[n]arene. Thesis defended in 2016. Khaled Belal, Multi Stimuli Responsive Aqueous Polymer Assemblies. Thesis defended in 2016. Present position: Post-Doc IFMAS. William Laure, Dopamine : a powerful toolbox for the grafting of polymers onto titanium based materials : design of "smart" surfaces and metallic stents. Thesis defended in 2014. Other co-advisor: Fournier David. Present position: Emploi CDI au 01/01/2017 socièté STAUB. Jonathan POTIER, New cyclodextrins-containing polytopic receptors for aqueous catalysis. Thesis defended in 2013. Other co-advisor: Fournier David. Léna Sambe, Electrochemically tuneable plug and play polymers . Thesis defended in 2013. Present position: R&D en chimie chez Synthomer, Angleterre. Aurélie Laquièvre, Plasticity elementary mechanism of amorphous polymer systems: influence of the modification of the macromolecular structure by click chemistry. Thesis defended in 2012. 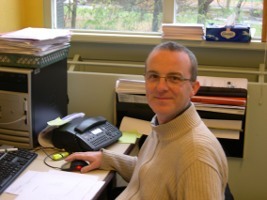 Other co-advisors: Jean-Marc LEFEBVRE, Fournier David. Present position: Post-doc à l'Université de Louvain - Belgique. Cédric Zobrist, Building of tunable polymer brush on titanium surfaces for biological applications. Thesis defended in 2011. Other co-advisor: Maude JIMENEZ. 2 seminars. 60 oral presentation(s), including 24 invited. 17 poster(s). Detailled list.